Not too long ago, Stuart Weitzman announced that it would be joining the gaggle of designers lining up to co-create with Gigi Hadid. Fresh off her much-fêted fall collaboration with Tommy Hilfiger, the model again donned her designer (dad) cap to help produce a limited-edition namesake boot for the much-loved shoe brand. Said booties feature a stacked heel and a sleek, combat silhouette. Each pair is outfitted with bold metallic eyelets, duo-toned laces and a detailed collar. 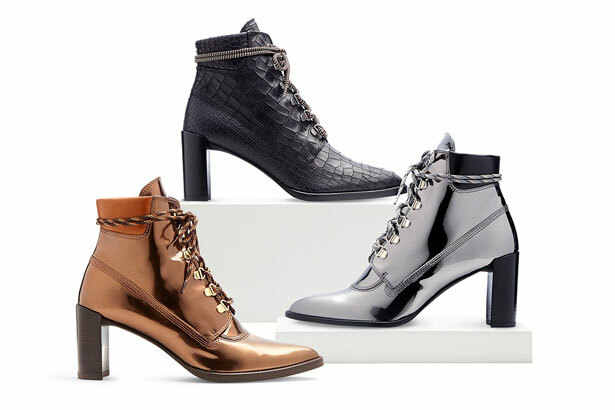 So as to provide “multiple options for her style squad,” the Gigi Boot comes in three colorways: silver, bronze and “a classic-yet-modern nero soft croco-calf leather.” The design captures Gigi’s tomboy chic style so perfectly we could swear we’ve seen her trotting around in them before. And in case anyone had any doubts about the versatility of the towering hiker heels, in a (#veryrare) James Franco-lensed promo, the boxing champ hits the gym in her Gigis, skipping rope, punching sandbags and besting a series of opponents coached by New York City nightlife queen Ladyfag (again, this video is so random). We will say this for the 1:59 second spot: it actually manages to be both fun and convincing (when it comes to the wearability of the shoes, that is). This isn’t the first time Gigi’s hit the gym to promote her co-branded wares (Maybelline and Reebok also gave us a ringside seat) but it is the first time we found ourselves fully engaged in the Gleason’s goings-on. The Pineapple Express star has truly found his umpteenth calling. The metallic styles are priced at $565, while the croco-calf version will run you about $598. A hefty sum, but you can comfort yourself in the knowledge that part of the Gigi Boot’s proceeds will benefit the non-profit Pencils of Promise, an organization devoted to “creating quality elementary education programs within the rural regions of developing nations.” Stuart Weitzman has promised to fund the construction of three elementary schools (in Ghana, Guatemala and Laos) before year’s end. Another reason to splurge — and we say this with utmost sincerity — is that, as hard as Gigi found the design process, this is by far her best collaborative work yet. Get the Gigi Boot at Stuart Weitzman.com or any of the brand’s retail locations.